This article is the first installment of the AMWN’s On the ground Showcase series. Want your initiative showcased? Read more about PACKA-CHING in the AMWN’s Strategy document for Africa, to be published on the AMWN this December. It’s a sunny morning in Langa, Cape Town. Choir songs from a nearby church ceremony are carried by a slight breeze over a large tarmac basketball court where queues of people are waiting at a brightly coloured mobile kiosk branded “PACKA-CHING” to turn their trash into cash. According to recent statistics, 95% of South Africa does not recycle, and as of 2017 the country has a 28% unemployment rate. 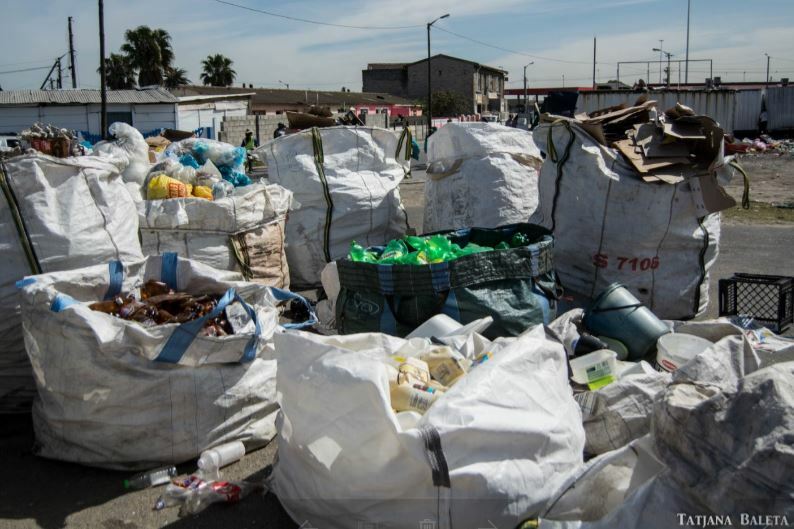 PACKA-CHING, a new community-based initiative spearheaded by POLYCO, seeks to increase household recycling rates and enable community upliftment in South African informal settlements and lower-income areas through incentivisation, convenience and education. 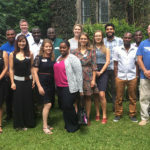 The African Marine Waste Network met with Project Manager, Brooke Kuhne, to see PACKA-CHING in action. Still in the pilot phase, PACKA-CHING was inspired by traditional models of the buy-back centre or “swap-shop” where trash is exchanged for cash or goods. “The inspiration from that was the incentive side of it – giving people something in return for their material,” says Kuhne. This creates a tangible benefit for recycling and automatically rewards participants for doing so. 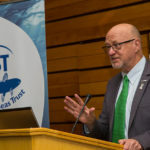 The goal is to target the household level in lower income areas – areas largely overlooked with regards to recycling education and municipal services. Thus, PACKA-CHING is tapping into an untouched stream of material and, through the program, showing this population of consumers that waste has value. PACKA-CHING partnered with WastePlan who agreed to buy the material PACKA-CHING purchases from the community. 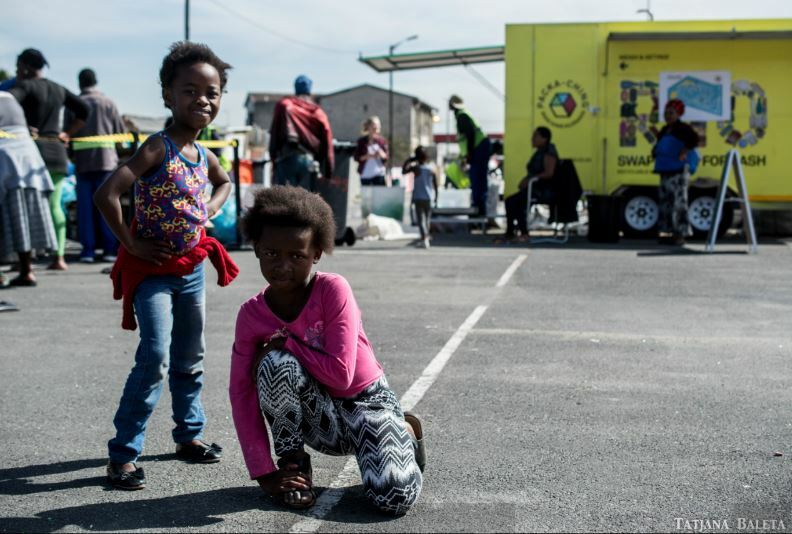 Their truck delivers the PACKA-CHING trailer – a kiosk with attached waste compacter – to one of two specific sites in Langa for a few hours, visiting each site weekly. This ensures access to the service for all community members and also enables the entire operation to be mobile; by bringing the facility to them, recycling is made more convenient for participants. The compactor allows PACKA-CHING to collect three times the material that they would without it. Community members bring their recyclable packaging material to the kiosk where the material is checked, weighed, and exchanged for money loaded onto a personal membership card. This alternative payment system removes the logistical challenge of accounting for cash and stock, while also avoiding the security issues currency attracts in lower-income areas. The card, developed in collaboration with The Rewards Factory, operates as a gift card that can be used where a bank card can, but the card is not linked to a bank account, so foreign nationals are not excluded from the program. All a participant needs is a cellphone, which also functions to communicate information about upcoming collections and allows users to receive notifications about their card balance. 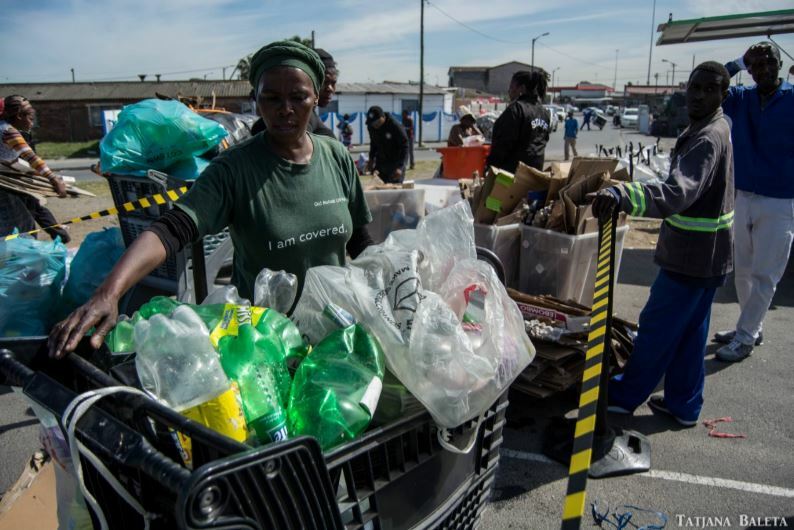 In its first month of operation, PACKA-CHING brought in 22 tonnes of recyclables from Langa – about the same weight as four elephants. Ongoing ethnographic studies suggest the majority of users are the elderly – particularly grandparents who are the main caregivers of children and use the income from PACKA-CHING to supplement government child care grants. 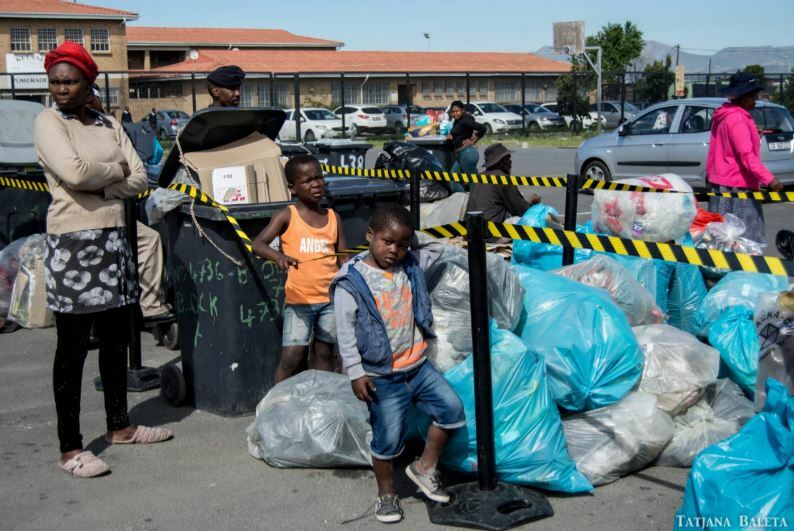 Waste drop offs are currently earning participants an average of about R40 per drop-off, or the equivalent of four loaves of bread – extra income that for many can go a long way. 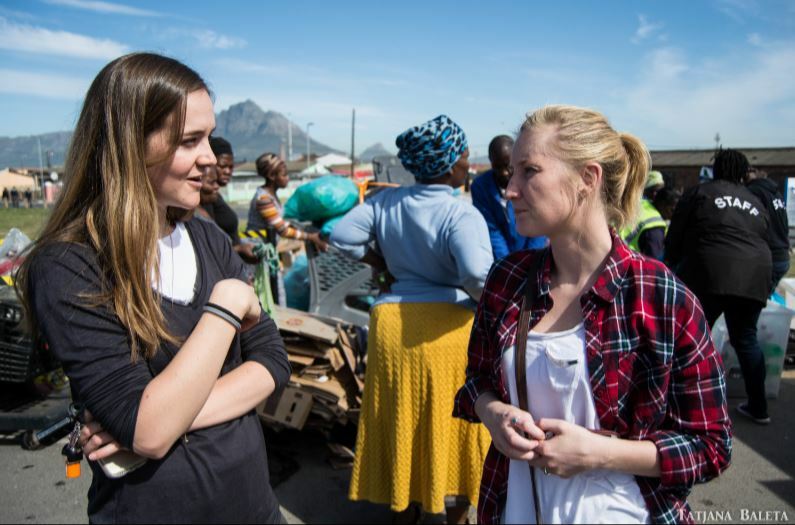 Opinions on waste differ depending on who you talk to and where you are, but on the whole a strong stigma of poverty and perceptions of low-class are attached to waste and waste collection, and Langa is no different. “That’s also one of the huge aims of PACKA-CHING – is to try and change people’s perception and see [waste] as a valuable item” says Kuhne. 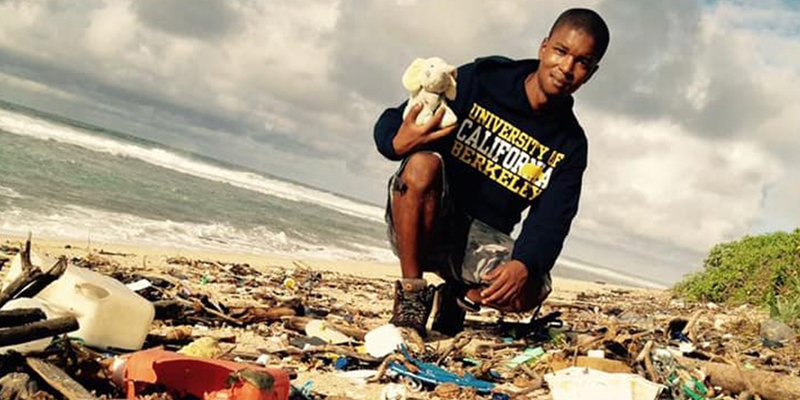 “So if you see people with waste [the response is] actually ‘Wow, that person is making money!’ ”. A crucial component of changing this negative perception is education and public awareness, and PACKA-CHING knows that. The project took care to use bright, attractive colours in their branding to convey a positive mood. In the month leading up to the project launch, they experimented with a variety of advertising methods and found on the ground, personal community activation to be the most effective. PACKA-CHING ran education campaigns in each of the nine schools in Langa, featuring educational performances with an industrial theatre group and an interactive mascot, Packa-man, PACKA-CHING’s logo come to life. They also produced educational booklets and hope that kids will not only grow up with recycling knowledge, but also take it home to their parents. Launched on the 21st of August 2017, PACKA-CHING is still in its infancy, but the pilot project is already making important observations that will inform future recycling initiatives. 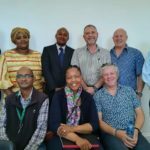 Careful consideration has been taken to make the PACKA-CHING model suitable to South Africa and to ensure the project is sustainable. 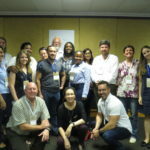 PACKA-CHING knows that in order to achieve maximum efficiency and viability they have to adapt their model and tailor it to the specific circumstances of the community and location they are working in. “There’s a lot of learning coming from it, and the project has been received so well; government is impressed and the community is responding really well,” Kuhne comments. Brooke has already received scores of emails from members of other communities asking for PACKA-CHING to roll out the initiative to their area. But PACKA-CHING knows that patience is key for success. 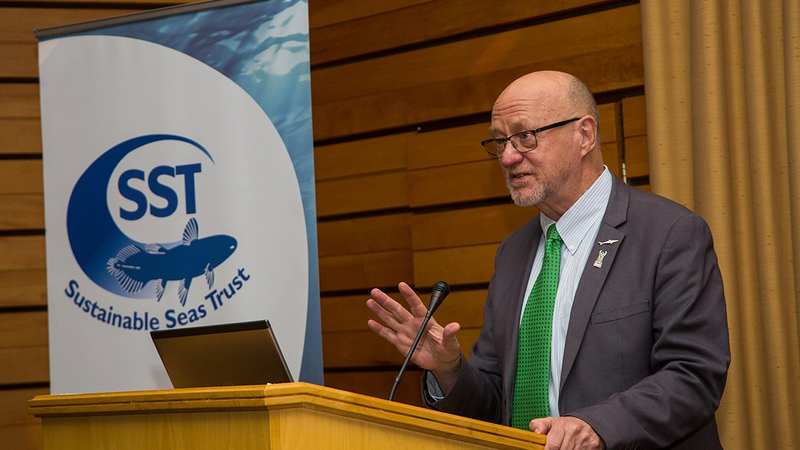 “These projects pop up, they start, they’re really effective, but then they’re not sustainable so they end up dying out. We don’t want that to happen, that’s why we’re taking our time to really tweak it slowly and get everything perfect” says Kuhne. In the future PACKA-CHING wants to adopt a franchise model, whereby community members can buy their own kiosk with a loan and pay it back with recycling material. In this way the project will become community owned and facilitate job creation and enterprise development. The project has already created employment for three staff members from Langa, recruited through a local NGO. PACKA-CHING’s future plans also include increasing their presence in schools, providing each with their own personal membership card. The project is also working on information booklets for the illiterate as well as increasing community meetings to better communicate the project and understand the community’s needs. On the bright, warm day of our site visit, streams of people arrived to participate; small children carrying plastic, trash-stuffed bags almost as big as themselves, adults pushing trolleys filled with cardboard and plastic bottles and seniors of the community resting on chairs in the shade of the mobile kiosk while waiting for materials to be weighed. It was easy to see that this initiative has the potential to make real change in this community. 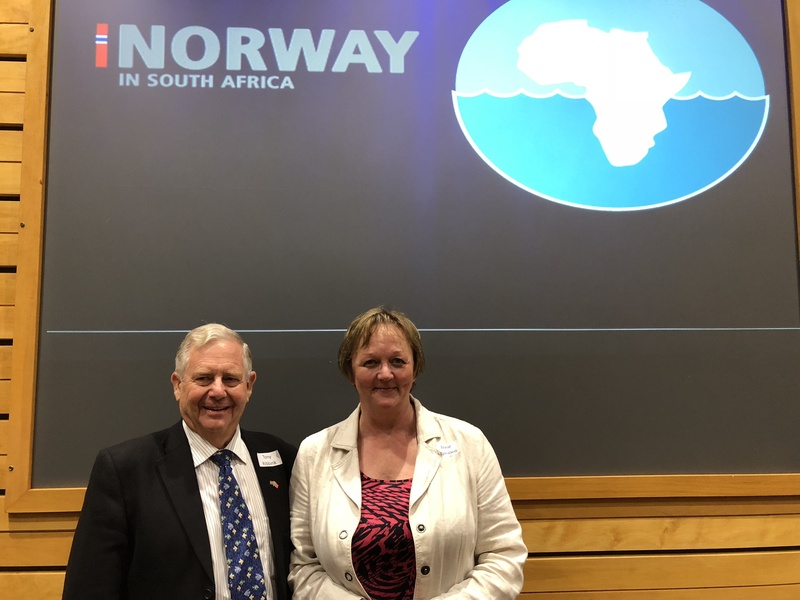 And with a new pilot project set to start in Johannesburg in February next year, the future looks bright for PACKA-CHING.